We are very lucky to have so many incredible people come into our lives. Meeting new people and building relationships is one of the things I love most about what we get to do at WildFire CrossFit. While it’s always great to have new people come into our lives, it’s just as sad when life takes them elsewhere. Almost 9 years ago we met Erin at the gym where we all got our start, CrossFit Scottsdale. She and her husband, Mike, had heard about CrossFit from friends and decided to come check it out. It wasn’t long before she was a staple in the Community. She participated in everything from local events and competitions. She helped run Friday Night Lights, the event we held each week for the very first CrossFit Open Competition in 2011. She even traveled to Denver with us for the first Regional competition that same year. At the time, Tiffany was running the CrossFit Kids program and thought Erin would be a great fit to help Coach. Like many of us who started Coaching, it may not necessarily have been what we were looking for, in a lot of ways, it is what we were meant to do. When we left Scottsdale, we had no idea whether our paths would cross again. Life has a funny way of connecting us to the people who are meant to be in them. Almost exactly 4 years ago we reconnected at a local competition, right up the street. By that time, Erin was Coaching at a gym in Cave Creek and Tiff and I were in the process of taking sole ownership of WildFire. During a break from competition, we invited her over to check out WildFire. Turns out, she was looking to get involved with a community like WildFire again. 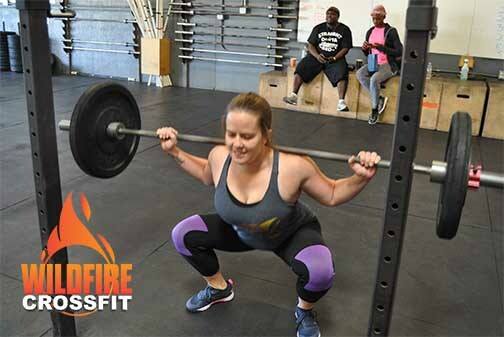 Since we were brought up in the same system of Coaching and running a gym at CrossFit Scottsdale, it didn’t take long for her to go from being a member to a Coach and then to helping us run the gym and make WildFire the special place it is today. Erin has had a tremendous impact on so many people’s lives with her positive attitude, constant smile, and knowledge of fitness. As a CrossFit Kids Coach, she’s helped so many kids move better, build confidence, prepare them for their chosen sports, and overall get incredible results. Even more important she has taught them that fitness is fun and been the spark that will keep them going as they get older. When she coaches adults, she brings a cheerful energy to every class making it fun for everyone. She has a way of getting more out of every athlete and challenging them to be their best. She is a great role model as an athlete and sets an example in her own fitness others want to follow. Tonight, is Erin’s last night of Coaching at WildFire although she will be back so we can send her off with a party on Friday night. She is moving North to Flagstaff for many new adventures I am sure life has in store for her. The good news is that she is close, and Friday will not be last time we will see Erin at WildFire CrossFit. We will celebrate a very fond farewell for Coach Erin at Summer Swolestice on Friday night, so come help us wish a very happy Bon Voyage.